In early October, Wafa' called for lone wolf attacks in the style of the Las Vegas mass shooting. They also lauded the June 2016 Pulse nightclub shooting after Omar Mateen's attack. In an August ISIS video showing an attack on a Catholic church in the Philippines, jihadists toppled a large crucifix and stomped on it. They also toppled and smashed statues of Jesus, Mary and saints, tore up photos of Pope Francis and Pope Benedict XVI and set fire to the parish. 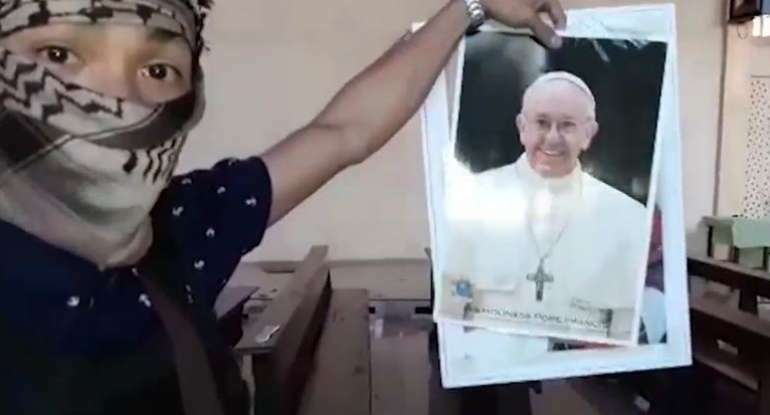 One of the jihadists, vowing that "we will make more revenge," held aloft a photo of Pope Francis. "We will be in Rome, inshallah," he says repeatedly before pointing his gun at the pontiff's picture. The ISIS magazine Rumiyah -- or Rome, reflecting the group's apocalyptic vision and ultimate plans to sack the Vatican -- hasn't published a new issue since September. Their early e-book detailing the Rome conquest strategy predicted mob bosses would put up tough resistance: "There is no doubt that if Muslims want to take over Italy, the Islamic State European fighters will have to ally with other militias to fight the Mafia before the conquest of Rome." In a rare candid moment, German media reported at least 200 cases of damaged churches in the region of Bavaria alone every year. In addition, attacks on summit crosses are also increasing in the region’s mountains. Crosses on several mountain tops have been toppled and destroyed with axes or saws. There’s a growing anger among the indigenous German population over the attacks. Some people think Islamists are behind it. But the attacks on churches and summit crosses are not isolated cases; for months, attacks on Christian symbols have been reported from several Bavarian cantons. There have been reports of desecration from Pentecost, Längental and from the “Prinzkopf” which lies between Sylvensteinstausee and Tyrol. Some repairs of historic churches can cost tens of thousands of euros. It’s an attack on people’s faith and communities suspect there is a religious motive behind it, e.g. Muslim migrants might be trying to sow fear in the population. Yes.Washington and israhell may be setting the stage. They're going to kill the heretic Modernist anti-pope for us? Are they doing this for free, or do we owe them something? I know that the usurper to the papal throne is in the vatican dressing up as pope, but what saddens me is the fact that if an attack does happen at the Vatican on the most holy day of our Lord's Nativity it will not only be an act of sacrilege (e.g. spilling blood in the hallowed tomb of St. Peter the Apostle) but will also bring with it the deaths of thousands of innocent pilgrims; pilgrims who are well-meaning and who could've been converted to the One True Saving Faith. We should look at them as lost children, deceived and blinded, whom we need to bring back to the fold of Holy Mother Church. Therefore, their death should never be a cause of celebration for us. As for the propagators and leaders of the modernist sect, who deceive and lead souls astray, they will reap what they have sown; God in His Divine Justice will make them pay for the great damage that they have done! I beg Almighty God to spare Rome from literal and physical destruction for the sake of the most holy martyrs interred and venerated in it, the most sacred relics of the blessed apostles Peter and Paul, and for the exaltation and triumph of the Most Holy Catholic Apostolic Roman Church!